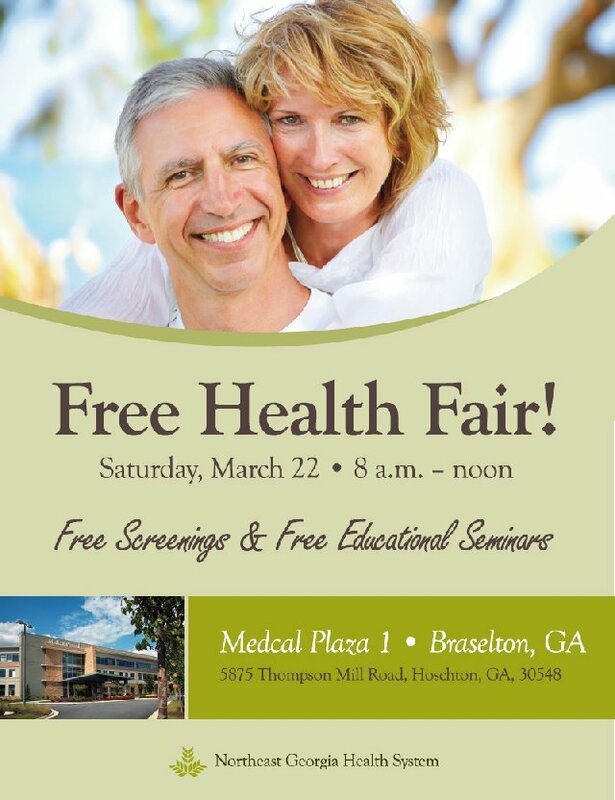 HOSCHTON, Ga. — Make a fresh start this spring by attending a free health fair at Medical Plaza 1 in Braselton on Saturday, March 22, from 8 a.m. to noon. The fair will offer free health screenings and educational seminars provided by medical professionals. The free screenings offered will include balance/falls risk, blood glucose (fasting preferred), blood pressure, carotid artery disease/stroke, varicose vein, lung function, sleep disorders, foot evaluations, peripheral arterial disease (pre-registration required, call 770-219-3840), hearing, musculoskeletal and BMI analysis. 10:30 a.m. – Leaking Bladder Keeping You at Home? The health fair is open to the public. A light continental breakfast and free giveaways will be provided. Come tour Medical Plaza 1 and learn more about the services provided, while taking advantage of free screenings and educational lectures. Medical Plaza 1 is located at 4875 Thompson Mill Road, Hoschton, Georgia, 30548, on the campus of the future Northeast Georgia Medical Center Braselton, scheduled to open in Spring 2015. For more information, visit nghs.com/braselton or call 770-219-3840.